In the Yankees' (3-2) AL East opener this year, Masahiro Tanaka took the mound for his second start after looking decent against the Astros to open up the season. He faced off against Aaron Sanchez of the Blue Jays (3-4). Tanaka walked two in the first inning, but the Blue Jays were unable to get anything out of it. After Brian McCann and Chase Headley both walked, Aaron Sanchez made a throwing error moving both McCann and Headley up a base to 2nd and 3rd. Starlin Castro grounded out to 2nd which scored Brian McCann and put the Yankees up 1-0. In the bottom of the inning, Tanaka walked the leadoff, but struck out the next three batters. Tanaka hit Kevin Pillar to lead off the bottom of the inning, followed by a Josh Donaldson single. Jose Bautista hit them both in with a double, putting the Blue Jays up 2-1. Neither the Yankees or the Blue Jays were able to get anything going in the 4th. Gregorius doubled with one out, but the Yankees couldn’t take advantage of the runner in scoring position. Pillar singled to lead off the bottom half. Donaldson then grounded to Headley who got Pillar at second but Donaldson advanced to second on a wild throw by Castro. Bautista then grounded out and Encarnacion struck out swinging. A-Rod started the inning off with a lineout, and Teixeira followed with a ground out to the pitcher. Then with 2 outs, Brian McCann hit a deep home run to right to tie the game up 2-2. Johnny Barbato replaced Masahiro Tanaka to start the bottom of the sixth to finish a somewhat shaky start by Tanaka. He pitched a scoreless inning and ended up with his first career win after the Yankees scored in the top half of the 7th. Brett Cecil replaced Aaron Sanchez for the Blue Jays in the top of the inning. Chase Headley led the inning off with a single to left followed by a Starlin Castro walk. Didi Gregorius then bunted them over to 2nd and 3rd for a sacrifice. 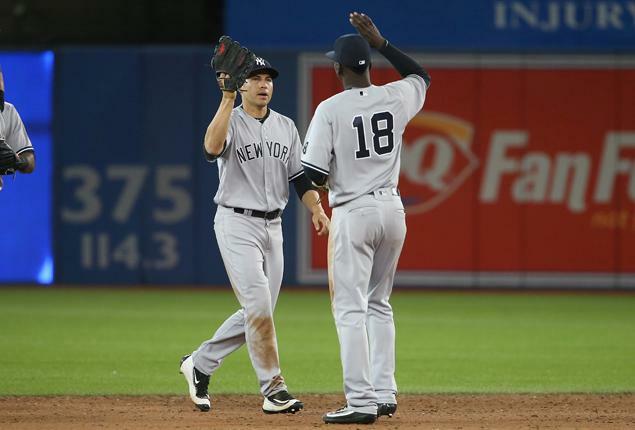 Then with 1 out, Jacoby Ellsbury's bloop single allowed Chase Headley to score and give the Yankees the 3-2 lead. Chasen Shreve replaced Barbato to begin the bottom half of the inning and left with two outs. Dellin Betances then replaced Shreve to face Jose Bautista and struck him out a filthy, full-count knuckle curve. With Jesse Chavez now on the mound for the Blue Jays, the Yankees were unable to capitalize on two singles. The Blue Jays went down in order. The Yankees went down in order against Gavin Floyd. Andrew Miller replaced Betances for the 9th and came out with the save as he set the Blue Jays down in order and the Yankees picked up their 4th win of the year and first AL East win of the year.